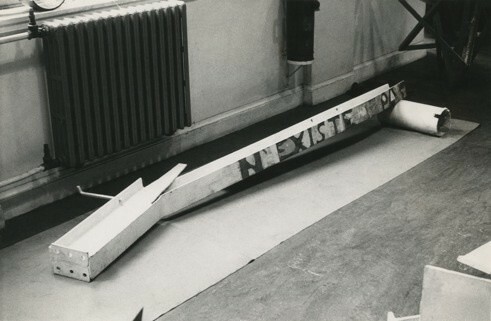 Barry Flanagan N'existe pas (1964) courtesy Barry Flanagan Foundation. Flat Time House, the former home and studio of the artist John Latham, will be the focus of this four month residency starting in November. The residency will engage in the interrogation of sculpture as a subject of research, rather than a static art form or medium, and will involve significant time spent in the archieves of John Latham and sculptor Barry Flanagan. The selected artist will be provided with accommodation, studio, stipend and a production budget towards new work. Additionally, the residency results in a public exhibition and publication in 2015. The judges are seeking domestic and international applications from established artists who have been working professionally for at least 5 years. The title of the residency, PHYNANCE, reflects Flanagan's interest 'Pataphysics, a science that rests 'on the truth of contradictions and exceptions', an approach also reflected in the work of his former teacher John Latham. PHYNANCE, originates from a pataphysical reference found in a drawing by Flanagan and the residency aims to continue and facilitate a similar approach in its sculptural production. The deadline for applications is August 24 2014. The residency is to begin late November 2014 and run until late March 2015, with an eight week exhibition to follow in the summer.